Personal and friendly plant glazing service to the construction and plant industry. The websites creator or author is Cab Screens. 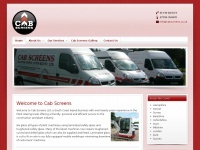 A profile of Cabscreens.co.uk was found on the social network Facebook. The web server with the IP-address 151.236.222.212 used by Cabscreens.co.uk is run by Linode and is located in Great Britain. This web server runs 4 other websites, their language is mostly english. A Apache server hosts the websites of Cabscreens.co.uk. The website uses the latest markup standard HTML 5. Indexing the data of the website and following hyperlinks on it is explicitly allowed by robot information. The visitors are redirected to the homepage of the website "/1/1/plant-glazing-specialists".